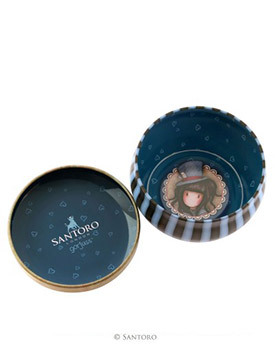 Store special keepsakes and tiny treasures in this adorable trinket tin! 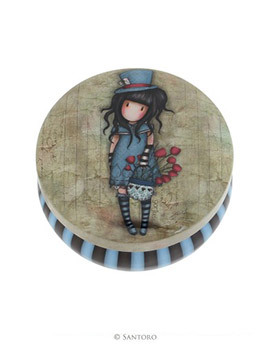 Adorned with the captivating The Hatter artwork in stone grey, midnight blue and rouge red tones, the tin is detailed with iconic black and blue stripes. Open the lid to reveal delicate printed hearts, alongside further detailing of The Hatter in a lace style print. Perfect for storing jewellery, craft items or cherished charms, it is just too pretty to put away; the most Gorjuss way to ornament a desk or dresser!